THERE’S one hour of every week that Annabel Palmer could “do over and over again” – Mass on Sundays. That special hour for Annabel, a Year 12 student from Mary MacKillop College, Nundah, is no doubt the highlight of her week. “Even though it’s an hour of my time, I think it’s the one hour of the week that I could do over and over again,” she said. Annabel’s discovery of the holiest of hours is relatively new – the 17 year old was only received into the Catholic Church at Easter. The daughter of an Anglican father and Catholic mother, she said her discovery of the Catholic faith came after hitting an “existential crisis” three years ago in a Studies of Religion class. “When I started doing Studies of Religion in Grade 10, we started to get the bigger questions thrown to us, like, ‘What is the meaning of life?’” Annabel said. “It was that time I started to realise I didn’t have my own meaning, I didn’t really see what was my meaning and what did I believe. “I think I went through a little existential crisis. Annabel never expected a trip to Europe would hold the answer to her questions. At the end of 2016 her family flew to England, their home country, to celebrate the Christmas holidays. They also tacked on a visit to Spain and Italy after Christmas Day. “It put a couple of miles on my soul,” Annabel said about the trip. In Spain, Annabel found herself at Mass in “an almost ancient church”. “I thought, this church saw the English Reformation, the Crusades, and how many monarchies,” Annabel, who studies modern history, said. “It was the first time I felt God actually spoke to me. After Mass her family were invited to a special feast where she had her first experience of Christian community. She also remembers being “one of a large group of teenagers”, proving to her that the Catholic Church was alive with young people. “I thought, ‘This is it’,” Annabel said. When she returned to Brisbane, she told her mum, a parishioner at Banyo-Nundah parish, she wanted to be baptised Catholic. Around the same time, the Australian Catholic bishops had announced that the 2017 liturgical year would be known as the Year of Youth. The Year of Youth, according to the bishops, would be a time for “acknowledging the Holy Spirit at work in the lives of young people, and young people acting upon the Holy Spirit in the life of the Church”. For Annabel, her decision to become a Catholic was an example of how the Holy Spirit was working in her own life. She spent most of 2017 reading about the Church “to find out what it’s like to be a Catholic”, joined the Banyo-Nundah parish community and choir, and completed the Rite of Christian Initiation of Adults with parish priest Fr Bernie Gallagher. At Easter, Annabel’s journey was complete when she was baptised, confirmed and received First Holy Communion. “When I became Catholic at Easter, I felt there was a change in me,” Annabel said. “I felt it was the start of something new, like there was a new part of my life starting. And she believes it’s no coincidence that her journey into the Church happened in the Year of Youth. “The Year of Youth, or the Year of finding yourself,” Annabel laughed. “I definitely think everything happens for a reason and in God’s time. “I feel like God allowed me to go through this journey, to be baptised in the Year of Youth, for a specific reason, that is to help bring young people back to the Church. Annabel said the recent Proclaim Conference she attended in Brisbane, helped her see what it was like to be a young person in the Catholic Church. “I remember sitting at the Proclaim Conference thinking, ‘I’m a Catholic and I’m proud to be one’,” she said. She also disagrees with the idea that young people are disconnecting from the Church. “I think youth go (to church) because they actually really do believe,” Annabel said. She encouraged young people who doubted their faith to find a community that could help them “spiritually connect” with the Church. 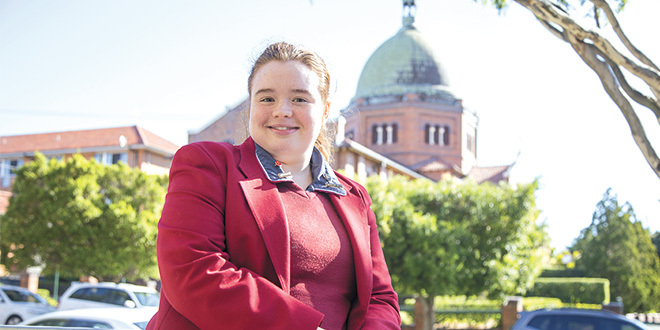 Annabel, who hopes to study occupational therapy at Australian Catholic University next year, said her next task was working on living the teachings of the Church. As well as volunteering for a local homework group helping struggling students, she has also assisted with sacramental preparation for children in the Banyo-Nundah parish and is excited to see the children find their faith like she did. “I think being Catholic is just one part of me that I’m still finding and searching, but also, how can I help contribute to the Catholic Church?” she said.